Kickstarter launched in the UK a bit more than 2 months ago, I wanted to have a look at the initial set of data. That data sample is quite small still, projects usually run for 30 days, so you only really have 2 months and half (kinda – see below) to look at, but still, it seemed interesting to check the early days. I also want to point out that the data collected was done differently this time. I have gone away from the manual collection of data and now run a fairly simple script to collect my info. This is still limited to successful projects only, but there is no lower limit on the amount those projects have raised as opposed to the $10 000 I had set before (I still think there is a point in excluding the small projects for my purpose in the analysis I am doing, but here, this is very useful). Note: I will refer to the UK project as GBP and the US ones as USD because the location of the creators doesn’t matter, it is the currency that backers see that makes a project UK or US. First thing to keep in mind is that I think those numbers are not perfect, each month has its own issues. The way I looked at the data, by looking at the end date, means that there are a lot more USD projects. GBP projects were only available from the 31st of October, and thus all the USD projects that started before the 31st of October and ended in November are accounted for. That makes the data for that month very very hard to compare and thus, probably useless. I left it nevertheless. 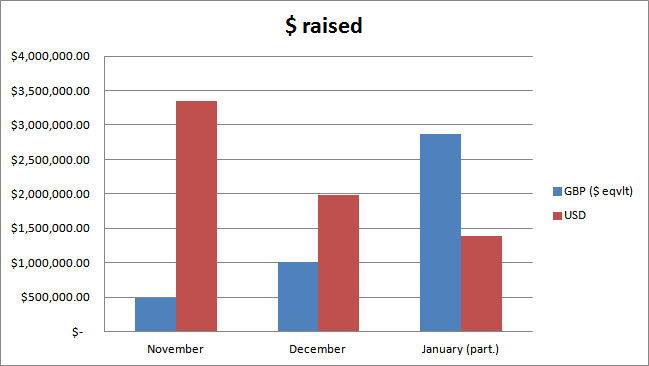 December is a difficult month, Kickstarter even recommends to creators to avoid launching a campaign during that period due to budgets being tighter for backers with the holidays and the shenanigans at the end of the year. But I still wanted to have a look, see how it goes. Kickstarter did their own 1st month anniversary post (when a large proportion of projects launched in December were still probably running), so let’s have a look. There are a LOT more projects that are successful in USD than GBP. Without the number of projects launched in the same time, that might just mean there is a lower volume of projects overall, but it feels that quite a few studios in the UK have been waiting for the GBP launch, those numbers seem *very* low to me. we are talking about a grand total of 10 games funded in GBP, when at the same time, there was 65 projects funded in USD! 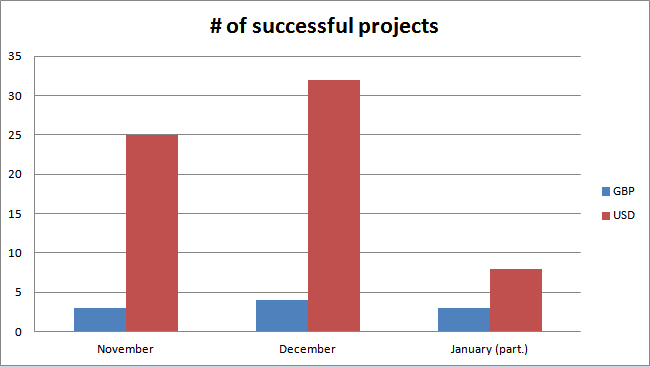 Even ignoring November, that’s a significant number of more projects. So, the different currencies make it extra difficult to compare projects. I have used a very linear conversion rate here (1.6) and I am bit afraid of what the data will look like over the coming month with varying rate. But what is interesting again is that GBP projects are getting closer to USD for the amount raised. This is due to very few, very high profile projects. 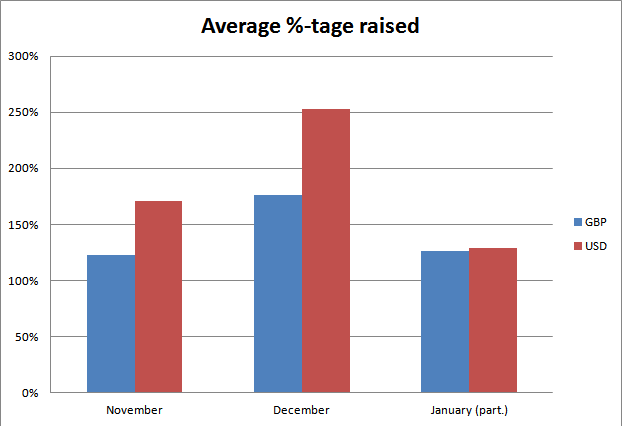 In December, Project: Godus is 82% of all the money raised in GBP. In January, Elite: Dangerous is 88%. That last graph, of the average percentage of the objective that has been raised, is the scary one to me. Both Godus and Elite were fairly high profile. And both succeeded by a low margin. We are far from the very strong success stories we have seen on USD projects. Again, numbers are very early in, taken from a time of the year that is a bit unusual, but the story it tells me is that GBP projects will take some time to be comparable to their USD counterparts. I wish I had the success ratio analysis, that would be a more telling story on the actual situation for the GBP video game projects. My feeling is that projects in GBP have a slightly higher failure ratio, but that’s not backed by any proper data. I would advise to GBP project to stick to lower objectives than what they would consider as USD project overall. The good news for me is that I now have a proper script to make it easier to gather the data, I can now add all projects, regardless of the amount AND I support the multiple currencies Kickstarter has in its system. So expect more Kickstarter data post in the future (and we have a few other topics to discuss as well, don’t you worry).